Stop wasting time recording time worked on projects! Project Partners offers two simple, easy to use applications that speed time entry into Oracle® E-Business Suite Projects™ and Oracle Time and Labor™. 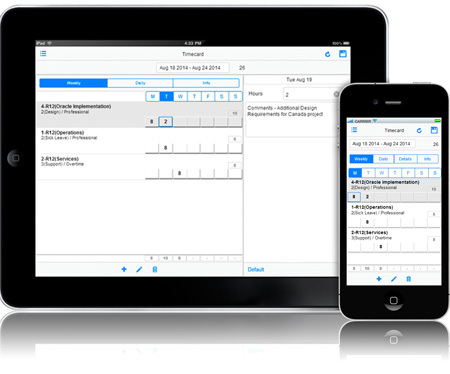 If you want to enter simple time cards via your smartphone, then mProjects is the right choice. 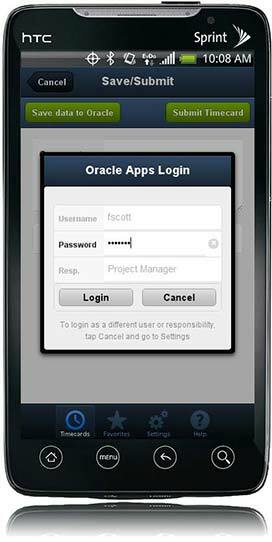 mProjects Time Management™ enables time entry from a smartphone or tablet, with complete integration to Oracle® Time and Labor. mProjects offers the following functionality. Simple, intuitive time entry ability requiring no training. Fast, single touch action to save and submit timecards and retrieve next period data, ensuring ease of use and reducing errors. Supports employees wherever they are, even when out of wireless range or operating in airplane mode. Users can track time using their smartphone or tablet and save to the corporate network when wireless reception is available. Sophisticated default mechanisms, including templates and lists of values simplify time entry while ensuring compliance with Oracle Applications. Enter time manually or use automated timeclock functionality. Interfaces through Oracle Time and Labor to Oracle E-Business Suite Projects to leverage full Oracle functionality and approval workflow. Leverages the Change and Late Audit functionality of Oracle Time and Labor to support Defense Contract Audit Agency (DCAA) requirements. The most accurate information is captured as it occurs, wherever that may be. Nothing is forgotten if it's recorded as it happens. With mProjects Time Management on their smartphones, your workforce can enter their time and task comments whether they're in flight operating in airplane mode or in a remote location without cellular reception, as easily as when they're in a city. Time can be entered using templates and defaults with minor daily adjustments, or use the automated timeclock to record work as it happens. And because it is so easy to submit daily updates from a smartphone, managers can see labor overruns in their earliest stages and take proactive steps before problems arise. mProjects Time Management utilizes an interface that any smartphone or tablet user will find intuitive and easy to use. A choice of time entry methods and timecard views allow each user to interact with the software in the manner they prefer, speeding end user adoption. mProjects Time Management employs the standard and secure Oracle self-service access to Oracle Applications and calls public APIs available in Oracle Time and Labor to validate the time entries and save and/or submit them to Oracle Time and Labor (OTL) as if entered from Oracle's HTML interface. Business rule validation is performed by OTL, so mProjects Time Management users can leverage standard Oracle Projects functionality such as project assignments and transaction controls. Standard Oracle process flows deliver full integration with Oracle Projects and Oracle Payroll. Because mProjects Time Management enforces standard Oracle Applications security, there is no need to worry about compromised data if a smartphone is lost. And users in the Defense Contracting industry will be glad to know that mProjects Time Mangement works with the Change and Late Audit functionality in Oracle Time and Labor to maintain a full audit trail as required by the Defense Contract Audit Agency.